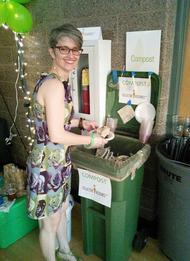 From the moment she hosted her first event using compostable products in 2010, Mary Beth Schaye has been hooked on zero waste. She joined Collective Resource on Earth Day the following year and has been an enthusiastic evangelist for composting ever since. Mary Beth has successfully designed waste diversion strategies for individuals, schools, houses of worship and other communities. She’s received the governor’s Environmental Hero award for her work at her daughter’s school. Whether you’re starting with a backyard bin, a kitchen bucket, a worm farm, or large-scale commercial collection, Mary Beth can be your good-natured guide.